Everyone has this vision in mind when it comes to filing cabinets. They are those clunky, ugly, and poorly-colored chunks of metal that have been the ultimate office eye-sore for decades. Consumers’ desire for a more welcoming work space has led designers to rethink storage solutions. Out of the demand for style and variety, the “modern” filing cabinet was born. The modern filing cabinet is a functional and stylish way to store important documents. Modern filing cabinets take shapes and colors that you just don’t see in dated filing cabinets. Several of the modern filing cabinets below feature bright colors, artistic designs, and anti-tilt safety features. Modern filing cabinets are safer, more secure, and undoubtedly more stylish. When it comes to interior design, especially in a workplace or home office, storage can often be overlooked. This leads to unsightly clutter, chunky and mismatched bins, and of course, outdated and ugly filing cabinets. By choosing a modern filing cabinet that fits the style of the room, you automatically allow your storage to become part of the design, rather than something you want to hide in a closet. By choosing a modern filing cabinet, you eliminate the need to keep it out of sight. Therefore, it is always easily accessible. As mentioned above, many of the modern filing cabinets available on the market have an anti-tilt feature. This means that only one drawer can be opened at a time, preventing the filing cabinet from falling over, hurting you, or breaking. Modern filing cabinets allow for functional design that won’t disrupt the flow of your office. They can be small enough to hide under your desk, but stylish enough that you will want to show them off anyway. Most modern filing cabinets are stable enough to support lightweight decor on top of them such as a vase or photo frame. This means your storage can actually add to your surface area, turning your office into a floral or nostalgic photo display. Hooray for filing! Lateral: Lateral filing cabinets are made for bigger offices with greater wall space. They are perfect for storing frequently used files. Vertical: You don’t need much wall space to accommodate these types of filing cabinets. The drawers are typically very deep, making this type of filing cabinet great for files that aren’t regularly accessed. Another factor to consider is the material that your filing cabinet is made from. Wood filing cabinets look great but aren’t as durable as steel filing cabinets when used daily. Many of the modern filing cabinets on the market are made from coated steel to ensure long-lasting durability for daily use cabinets. Size is one of the most important factors to consider when choosing your modern filing cabinet. Even the most stylish filing cabinet will look out of place if it is too big for your office. This will also make it harder to access files. Be sure to measure your space before deciding on a filing cabinet. Many modern filing cabinets are small enough to fit right under your desk, but there are bigger ones available for larger offices. Many modern filing cabinets feature accent colors either on the handles or on the entire front of the filing cabinet. Keep color in mind when choosing the right cabinet to match your home decor. Many modern filing cabinets have white or black as the base color and then use brighter colors to accent the front and handles. This helps create a subtle and sleek look. You can also use modern filing cabinets to declutter your work space in a way that is both stylish and effective. If you’ve got tons of paperwork sitting it boxes or your old filing cabinet is falling apart, it may be time to consider an upgrade to a modern filing cabinet. 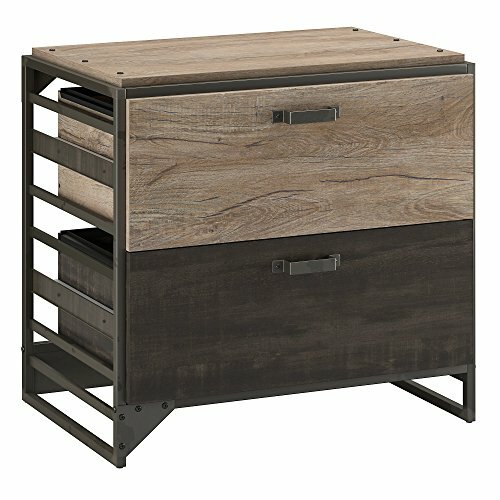 Product Features: If you can’t get enough of the popular rustic look, this may be the filing cabinet for you. Crafted with sustainable, high-quality, engineered wood, this 31.7″ x 22.2″ x 30″ filing cabinet holds legal and letter sized files. Each drawer can hold 50 pounds. The finish is stain and scratch resistant and the drawers slide on a ball-bearing full-extension track. 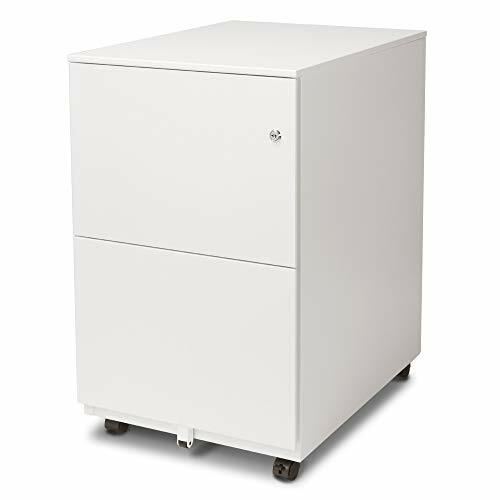 Product Features: This snow white filing cabinet isn’t just modern, it’s futuristic. This filing cabinet is a great accent for any office with a crisp, clean look. White is the latest trend in interior decorating and this all-white filing cabinet fits the bill perfectly. The interior and exterior are both coated in white-powder paint so it looks good inside and out. This sleek filing cabinet is sturdy and built to last. It accommodates both legal and letter-sized files. Product Features: This is every architect’s dream. This rack is 84 inches tall, and only 21 inches wide, saving you floor space while neatly storing your blueprints. 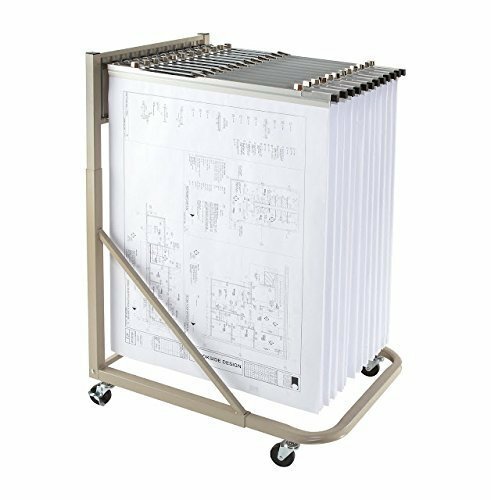 The heavy duty frame can hold 960 pounds of blueprints and other rolled documents. Say goodbye to disorganized documents rolling all over your office. This rack is designed to accommodate many different roll sizes from small to extra large. The rack includes wall mounting hardware for added support. 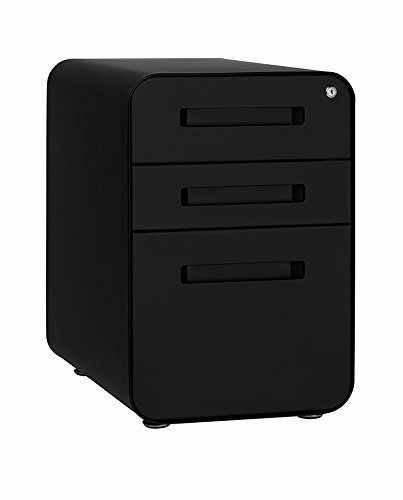 Product Features: This compact filing cabinet is made to fit right under your desk. The matte white coated steel with green accents on the drawers can match many home decor styles. All three drawers are locking and glide with ease. 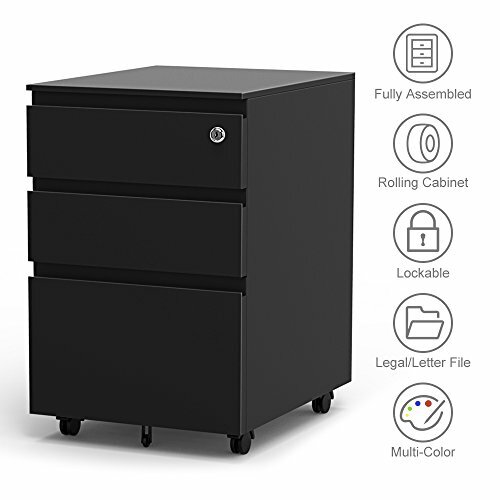 This filing cabinet holds legal and letter style files with no extra hardware needed. It even comes with a pencil tray and drawer divider. Product Features: This modern filing cabinet makes great use of vertical wall space while saving your office floor space with dimensions of 26.5″ x 16.8″ x 15.75″. This is perfect for any home or private office because it looks sleek, but not too corporate. This filing cabinet has been reviewed as unsturdy, so it isn’t recommended for large amounts of files. This filing cabinet was designed to look like a piece of furniture, so it blends right in with your other home decor. Product Features: This filing cabinet is super cute and comes in a white and aquamarine color-scheme. This would make a great filing cabinet for a dorm room or small office. It adds color and simplicity while providing adequate storage space for important documents. It has a removable stationary drawer and can be locked. Only one drawer can open at a time for added safety. It is made from durable metal to ensure a long-lasting storage solution. 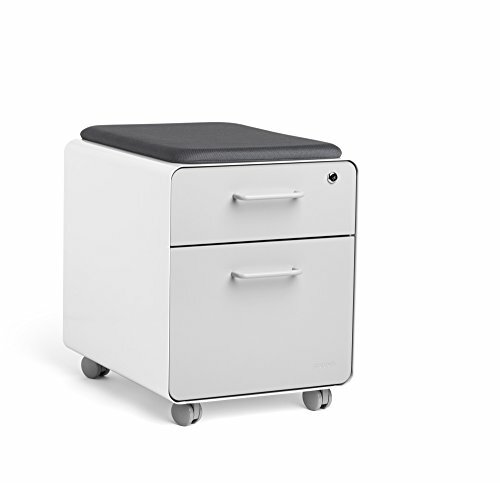 Product Features: This rolling filing cabinet fits under most desks, which can save you precious office space. While it is small enough to be tucked away under a desk, its stylish design begs to be seen! This design features a uniformly colored top, siding, and a colored face. Color choices for this modern filing cabinet include teal, pink, orange, white, and black. 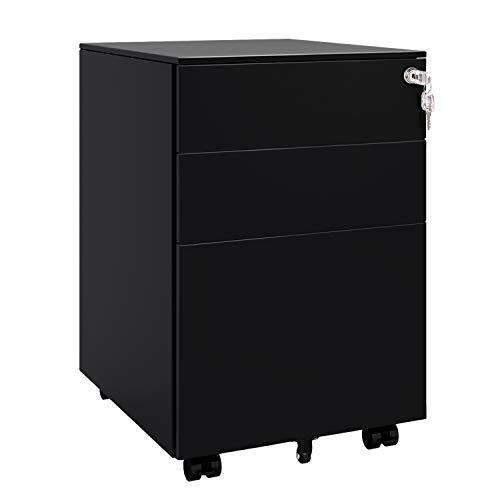 This filing cabinet is constructed from durable steel and features an anti-tilt mechanism. This can make a great personal filing cabinet that provides storage and an interesting pop of color. It also includes a pencil tray. 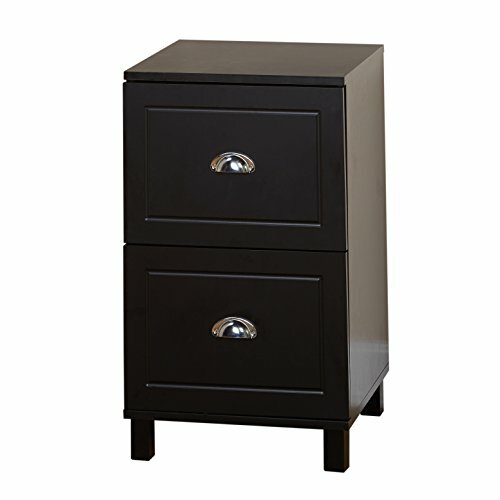 Product Features: This rolling, three-drawer, filing cabinet has an industrial feel with a big color pop. Available in orange, neon green, and yellow, this filing cabinet was built to stand out. Rounded corners ensure that you won’t get hurt on any sharp edges while you are busy working. These filing cabinets would look great in any studio or work space that has an artsy or industrious design. The cabinet is lockable and has an anti-tilt mechanism. It also comes pre-assembled. Modern filing cabinets can come in many shapes, sizes, and colors. The demand from consumers has created a supply that suits the needs and styles of everyone. Whether you are an architect that needs a nifty blueprint rack, an artist who wants a stylish edition to your studio storage situation, or just someone who desires to brighten up and organize your office, there is a filing cabinet for you.